Going to grad school is a big moment of transition in your life. Just as the transition from high school to university makes room for big changes in your life, so does the move from undergrad to grad. A lot of us move to a different university, different city, different province, different country. Being in a new place may mean that you’re missing your social network, best friends, or family, but it means that you’re gaining a fresh start. Going to grad school is a huge change and also the perfect opportunity to make the changes you want in your life. I took advantage of this and I’ve seen my classmates take advantage of the change too – all to improve our lives. Thus, my advice to new grad students is to take some risks and try new things. Even if you don’t love everything that you try, you might find something that surprises you! You can start from the get-go joining clubs, going to social events, or taking dance classes – these are all wonderful ways to make friends when you’re in a new place. For me, trying new social things came a bit later. First, I started by taking risks and trying things alone. When I first got to St. John’s, I went on a lot of hikes with my dog. I would pull up Google Maps and look up hiking routes near me. St. John’s is full of them and everything is within a relatively short drive! I went to visit historic sites like Signal Hill and Cape Spear, then moved on to mountain hikes. I found that when I went to class the following week and people chatted about their weekends, folks would always follow up my hiking adventures with a recommendation for hiking trails. Always trust the locals’ recommendations! I took the trails they suggested, hiked them, and absolutely loved it! 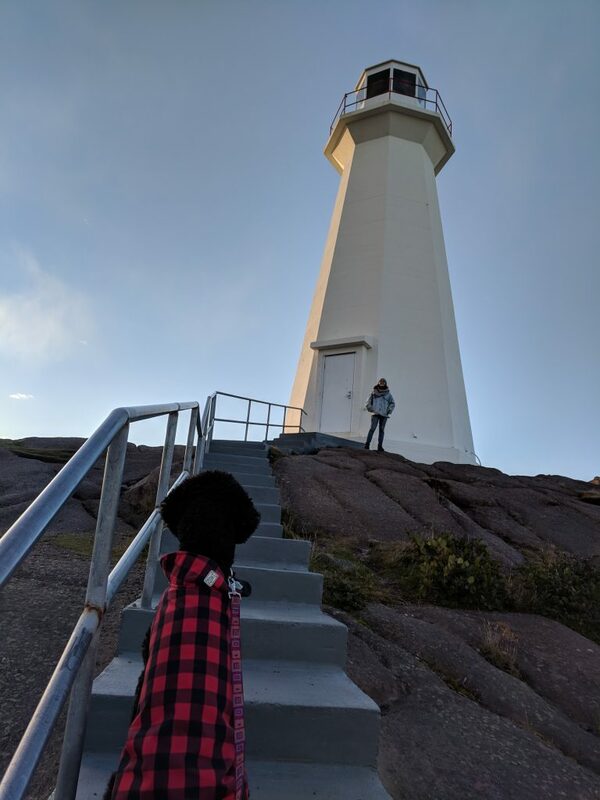 Sight-seeing at Cape Spear with my dog, Randy, and friend! Another thing I took a risk with is school. I know it feels like grad school is a place where you should have everything figured out, but it’s not. Grad school is the place for intellectual exploration. You should be broadening your mind as much as possible to find what you’re truly passionate about. Take risks and do your research projects and papers on something you’re interested in, not necessarily a safe topic. Maybe it’s a part of the literature you’ve never explored before or an outlandish idea you have – grad school is the time to test it out! Similarly, you can take risks with your course choice. If you have an elective, why not choose something you’re interested in but don’t know much about? It will broaden your knowledge and teach you some new perspectives. I’m a qualitative researcher with interest in symbolic interactionism, social deviance, and Greek mythology. I know absolutely nothing about economics – so I decided to take an economic development course as my elective. At first, I struggled with the readings because all of the terms were unfamiliar. But after a few weeks, the content started to sink in and I learned so much about foreign aid and foreign development – something I had known nothing about! I’m really glad I took that risk on the course – my whole perspective has changed and I feel as though the class helped me grow as a scholar and individual. Now, I think it’s also important to take risks in social situations – that’s how you make friends. I’ve found that my grad school experience has become so much better since I’ve made solid friends. I made them through hanging around queer spaces on campus and aggressively asking people to hang out and study or get coffee. Sometimes you have to take the chance and ask someone to hang out outside of class or campus – I find it’s always turned out well and resulted in friendship. Other risks may be in trying a new club, a new sport, a class at the gym, going to a protest, attending a panel or extracurricular lecture, or hanging out after class to chat with people. Whatever your comfort level with social interaction, I’d encourage you to push yourself just a little bit outside that comfort zone so that you’re in a better position to make friends. Finally, I strongly recommend that you take a risk to try something that you’ve always wanted to try. For me, that was drag. Just this past week, I did my first drag show and it was amazing! I’ve wanted to do it for months but had no idea how to go about it. Eventually, I asked a friend who does drag to teach me how to do makeup and create a routine. They encouraged me to sign up for an event, and as it approached, my excitement and anxiety grew. You’ll probably experience a lot of anxiety before doing something completely new, but it’s well worth it. There was a huge sense of relief and achievement when I finally got into drag, did my lipsync routine, and left the stage. It was a rush to do something I’d been looking so forward to! Along with accomplishing a goal, I made new friends and built my confidence. Doing this helped me to become more of the person I want to be. I stepped outside my comfort zone and challenged myself to take a risk. 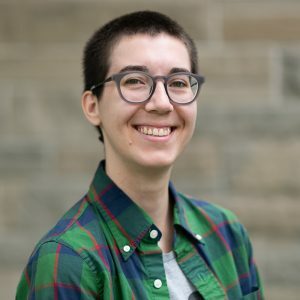 Coming to grad school has given me the opportunity to make some changes in my life for the better – now I’m taking risks and trying out new things! As I’ve transitioned through school, I’ve grown as a scholar and as a person. Continually taking risks on new things has helped me to continue this growth. I’m now happier than I’ve ever been because of the changes I’ve made and the new things I’ve tried.